still for the purist in you"
The major problem with reviewing rolling papers is that while the packaging varies greatly and in many cases is an art form unto itself, the papers inside this wonderful packaging are often very similar, if not identical. Characteristics such as thickness, color, perforations, and the like vary to some degree as do the preferences of individual users of the papers. Some like them thick and easier to roll, while some like them very sheer in order to avoid any paper taste added to their smoke. 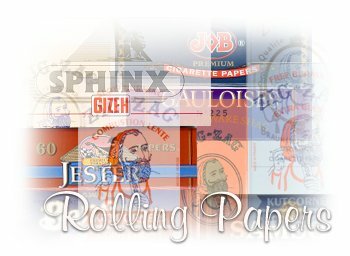 The new Gizeh Sphinx Papers ( www.gizehofnorthamerica.com ) are a cut cornered version of their very popular papers that allow the finished roll (due to the cut corners) to be much smoother at the ends. Those of us who have tried these papers are impressed with their smoothness and neutral taste. The package is dual chambered meaning you get more papers (100 to be precise) per pack. Zig Zag papers ( www.zigzag.com ) are perhaps the most well known papers in the world. They have been lauded for years for their consistency and quality and offer a number of design and sizes to meet the varying demands of the hand rolling public. From the originals I remember from the 60's, at left, to the various burning properties of their slow and fast (free) burning offerings, ZigZag really does enjoy an immense visibility at nearly ever general merchandise store in the US. We cannot say enough about the viability of the company and its accesibility to it customers through their web site and their customer service organization. I can't imagine they get too many complaints but they always seem to answer our reader's questions and concerns promptly and comprehensively. There is one issue however, that really burns me up when it comes to ZigZag products and that is, we are beginning to hear of knock-offs or counterfit Zig-Zag papers and find that of concern mainly because of the way it could possibly damage a great company and cause the consumer to get less than a quality product. The knock-offs are easily recognized by looking on the back of the pack to see if they are made by the North Atlantic Operating Company of Louisville. If they do not contain those words, they are counterfit. If you find such bogus papers, let us know or go to the ZigZag web site and email them with your findings, including where you purchased the fraudulent papers. We're told that these imitations are of substandard quality and are no less expensive that the authentic ZigZags. It is in everyone's best interest to weed out these and other purveyors of copyright and trademark infringed products so that good companies like ZigZag get their fair share of the market. I can't imagin a world without ZigZag papers. They have become part of our culture and need to be honored as such. When you buy pouches or tins of rolling tobacco you usually get free papers. Surprisingly, many people still buy papers in addition to their tobacco purchase. One might ask why (as we did) so we began examining carefully the so-called complimentary papers that come as part of the tobacco package. And you know what, they are all pretty darn good. Most are a little on the thick side for the connoisuer who usually prefers a more sheer paper, but they all seem to work quite well and have little or no added taste components that interfer with the tobacco taste. They are all very similar and may likely be made by the same company. Some tobaccos like Top and Bugler and even Roll Rich come with some pretty funky papers. But brands like those shown here have papers that are nearly, if not every bit as good, as the ones you purchase. Again sheer they are not, but otherwise, they work just fine and save you the additional buck or so if you are on a tight budget. In the long run you probably will need to by more papers as they do not always roll all of the tobacco in the pouch, but we thought you would like to know, especially for those who are hand rolling rather than injecting under the incorrect notion that it is less expensive. The point is, if you buy papers as well as tobacco, injecting is less expensive. For instance most good rolling papers cost between $1 to $2 for a pack of 30 to 100 leaves, while tubes cost around $2-$3 for 200. So depending on the brand of papers you like and the prices you have to pay, you can see where tubes and therefore injection smoking may be less expensive (for tobacco at least). However, if you like strong, euro-style tobaccos like the Blue versions of Bal, Samson, or Gauloises, Drum, or even Jester, hand or machine rolling is often a better fit as you can control the diameter of the stick and the thinner the stick the milder the smoke. Of course some people like to fall over after a smoke. I prefer the vertical.